An industry leader's guide to making Lyft and Uber work for you. In less than five years, ridesharing has grown from nonexistence into a billion dollar industry. Uber now has two million drivers in the United States, Lyft has seven hundred thousand, and both show no signs of slowing down. Despite the large number of drivers, Uber and Lyft provide little in the way of help for new drivers, who complain that there is a lack of guidance when starting out. Campbell explains these and much more, also including funny, shocking, and bizarre tales from the road. Whether you are thinking about becoming a driver or a veteran wondering about UberPool and tax help, The Rideshare Guide by the Rideshare Guy has the answers. Harry Campbell is the founder, editor, and director of TheRideshareGuy.com, which has become the industry's leading resource for drivers. Its blog, podcast, and YouTube tutorials reach hundreds of thousands of users per month, and continue to provide a voice for drivers. Campbell has been featured in New York Times, Forbes, CNET, WIRED, the LA Times, the Huffington Post, and many other media outlets for his work. He lives in Los Angeles, California. "Few people are as familiar with the ins-and-outs of rideshare driving as Harry. His deep understanding of what it's like to get behind the wheel as a rideshare driver combined with his passion for helping others make him a valuable resource for folks who want to get even more out of their experience driving with Uber." 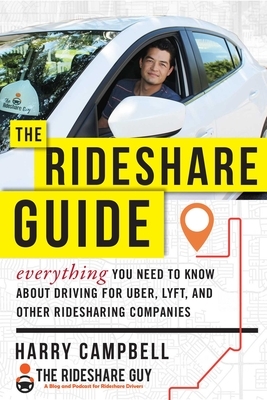 "A guide every driver should have in their glovebox, from one of Lyft’s earliest pioneers. Harry shares all the tips that have made him successful — not only as a driver, but as a trusted entrepreneur." "Companies like Uber and Lyft offer exciting opportunities for drivers, along with plenty of risks. No one is better suited to help them navigate this difficult terrain than the Rideshare Guy, Harry Campbell. This book is indispensable reading." "In the rideshare business, only one name comes to my mind—Harry Campbell, the man that inspired me to enter this exciting market. His blog became my rideshare bible and very quickly I climbed the rideshare ranks applying his genius."